Many of my clients are self employed individuals who hire and pay employees. Often the employee does not agree with the IRS wage levy and they want the employer to “ignore” the levy. At this point the employer, a small business owner who depends upon the employee, is in a difficult spot. The employees may appeal to the employer’s sympathies for the hardship the levy will cause or threaten legal action. The employer must ask themselves, should we acquiesce to the employee’s wishes or should we comply with the levy and strain the relationship with our employee? When an employee fails to satisfy his or her tax liabilities, the IRS has an array of administrative tools that it can call upon to enforce collections upon the taxpayer. One method of enforced collections is to levy the taxpayer’s wages. The Internal Revenue Code contains provisions that require employers to help the IRS in its tax collection efforts. IRC § 6332 provides that “any person in possession of (or obligated with respect to) property or rights to property subject to levy upon which a levy has been made shall, upon demand of the Secretary, surrender such property or rights … to the Secretary.” Employers are within the category of persons required to comply with a levy. Upon receiving an IRS levy against an employee, the employer must withhold and remit amounts contained in the IRS table. 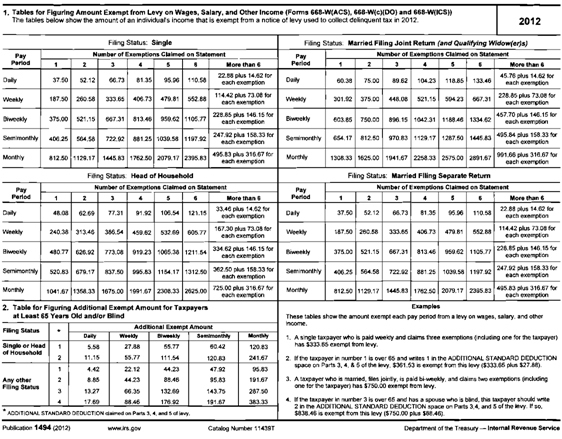 This table is included with this article, or it can be found in IRS Publication 1494 . Employers are to continue to garnish an employee’s wages until either the outstanding tax liability has been satisfied or the levy is released. Employers that do not comply or refuse to surrender the property subject to a levy can be held personally liable for the value of the property not surrendered. The IRS can subject the employer to additional penalties equal to 50% of that property’s value (IRC § 6332(d)(2)). Fortunately, section 6332(e) relieves the employer (or any third party subject to a levy) from having to make the decision: An employer who complies with a levy “shall be discharged from any obligation or liability to the delinquent taxpayer and any other person with respect to such property or rights to property arising from such surrender or payment” (emphasis added). This point was recently affirmed in a case where the court held not only that section 6332(e) precluded the taxpayer from seeking relief against his employer but also, more broadly, held that, “Even where a levy is determined to be invalid, the custodian of the property is still immune from liability from actions arising from its compliance with the levy” (Hunter v. University of Louisville, No. 2010-CA-001613-MR, slip op. at 4 (Ky. Ct. App. 8/5/11)). Employers do not have much of a choice in deciding whether to comply with an IRS levy. The employer has much to lose and nothing to gain from noncompliance. Employers should nonetheless be aware of their legal responsibilities to both the IRS and their employees in dealing with levies.